Sunrise over the Sangre De Cristo Range on an icy October morning. I was watching the weather maps the other day, and noticed that high clouds would be moving in fro the north as a cold front was moving towards northern Colorado yesterday. I figured the sunrise would be special, so I got up at 4 am and headed for my favorite spot, the Great Sand Dunes National Park. Despite the re-opening of the government, they had yet to remove the barricades that prevented you from entering the park; so I went to ‘Plan B’–a short drive west to the San Luis Lakes State Park. No barricaes there. No people either, except a few hunters who were disturbing my peaceful morning. I’m not sure why, but the lakes themselves have either been drained or lost all their water, so right now they’re just mud puddles, but thanks to the cold nights they were nicely frozen puddles, and reflected my forecast sunrise quite nicely. 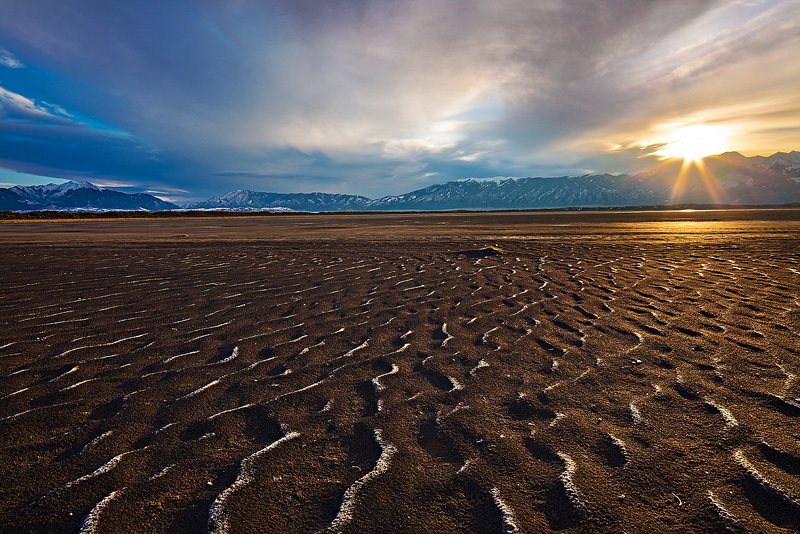 As the sun finally rose over the Sangre De Cristo Range, I grabbed this shot of the range and sandy lakeshore, along with distant snow-capped dunes. Sand Dunes and dry lake bed after a mid-October snow. On the way out, I took this shot from snowy La Veta Pass, with the Spanish Peaks in the distance. It was a beautiful fall morning! A September storm clears at sunset over the Tetons. 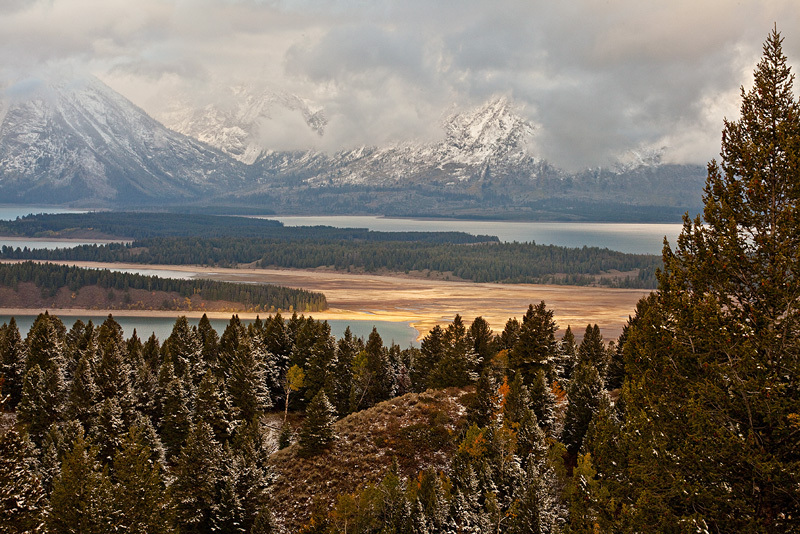 I left Aspen and headed north to Jackson Hole, to wait out a three-day snowstorm that I hoped would bring some moody conditions to Grand Teton National Park. While waiting for the storm to clear (it never really did) I hiked around in the new snow that was falling; it kept most people off the trails and the park was nice and peaceful without the crowds. 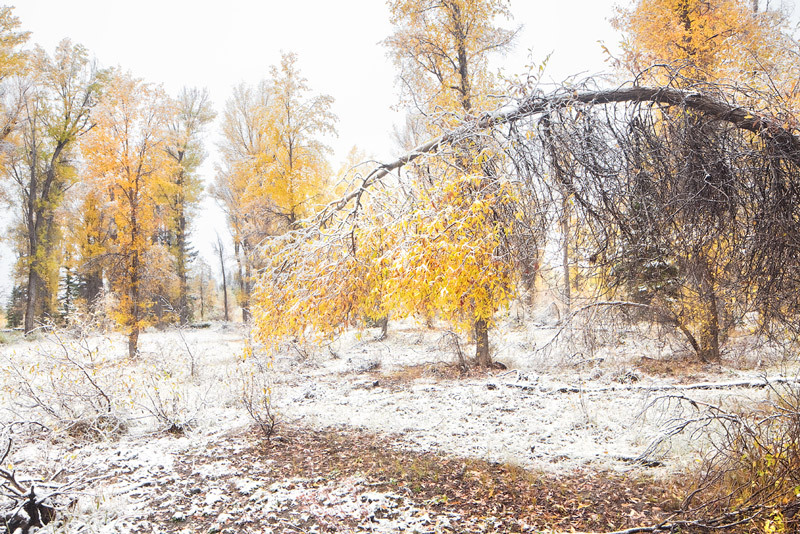 It wasn’t very cold in the valley, so most of the snow was melting on the ground, but it coated the vegetation in a slushy blanket. September snowfall at Schwacher’s Landing. 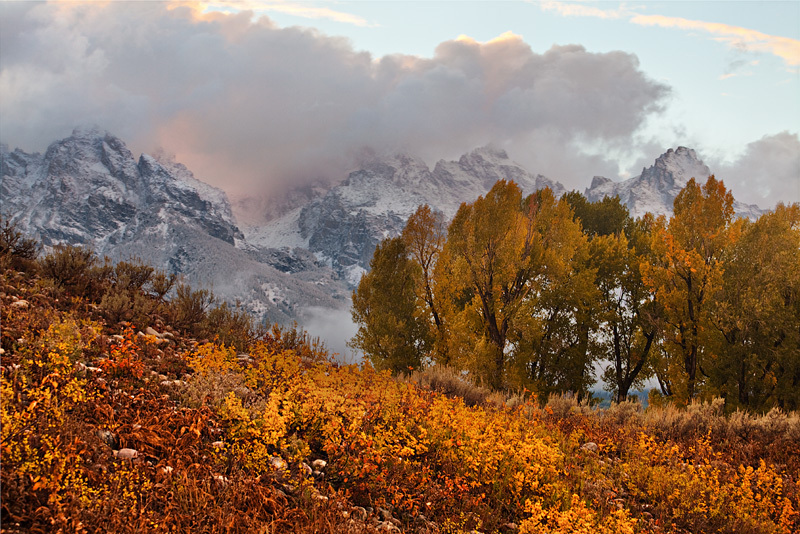 September snowfall in the Tetons. The storm briefly took a break at sunset, enabling me to take a few shots of the range as clouds swirled around the peak. The following morning I headed up Signal Mountain in hopes of getting above the light snow that was still falling in the valley. It was cold and raw, and never did clear out, but the light occasionally lead to some striking scenes of the valley and distant peaks. With little hope of the snow and rain ever quitting, I roamed around the park and looked for opportunities to take some shots of the wildlife and ever-changing scenery. 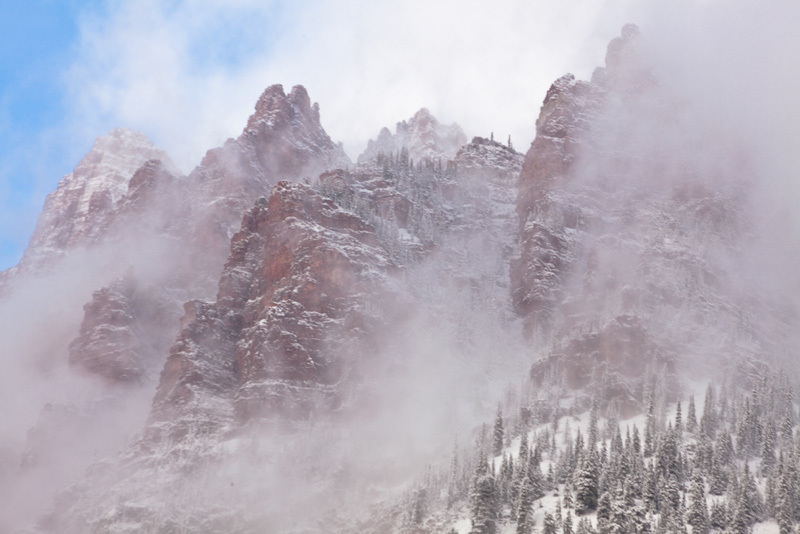 It wasn’t the stuff of postcards, but there’s only one first real snowfall of the season, and it was nice to be a part of it in one of our nicest National Parks. 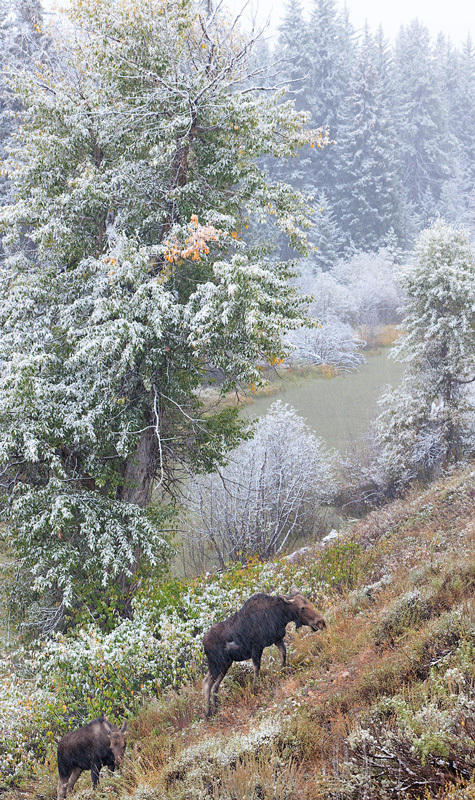 A couple moose during an early snowfall in the Tetons. 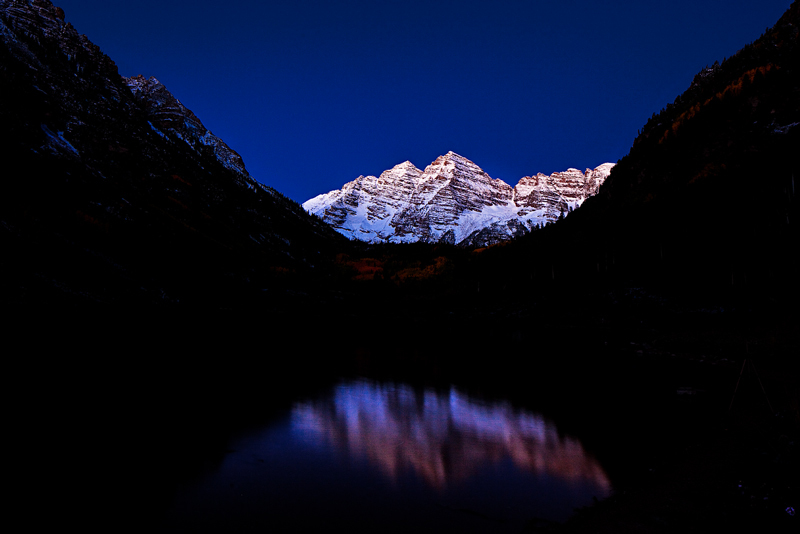 Maroon Lake and Bells, 45 minutes before sunrise. Just got back from an eight day trip through Colorado and Wyoming to photograph this year’s fall colors. 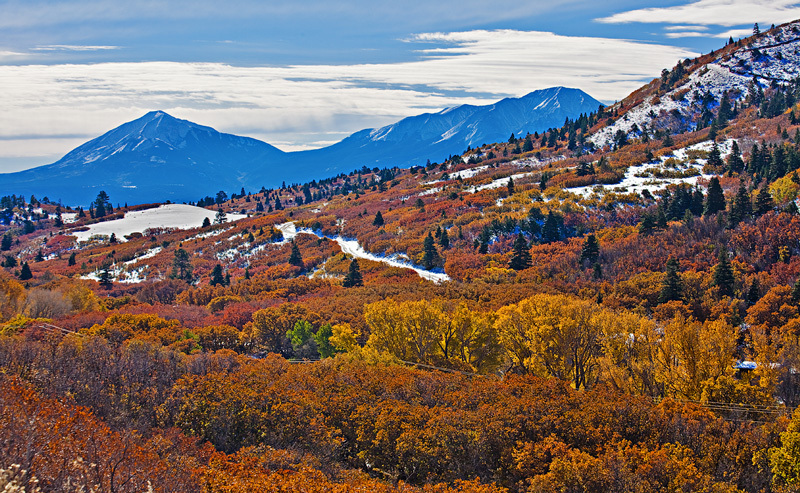 It has been a terrible year overall for fall foliage in the Rockies; too much rain followed by early wet snows have done a number on the leaves, which were late changing to begin with. But, I still had a good trip overall–drank lots of microbrews and ate lots of good food–certainly can’t complain too much. My next 3 or 4 blog entries will be dedicated to this trip; I don’t usually get out for a week’s time, so I’ve got a bunch of new photos to share. 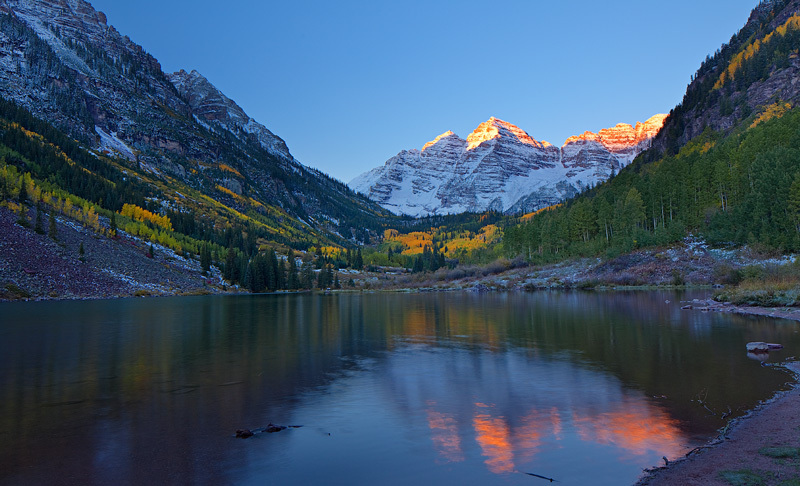 First, stop, the infamous Maroon Bells in Aspen, Colorado. I met up with a couple of fellow Colorado photographer friends up there, including Todd Caudle and Art Escobado. We were hoping for some good clearing-storm conditions at the lake, site of the most photographed mountain in America. 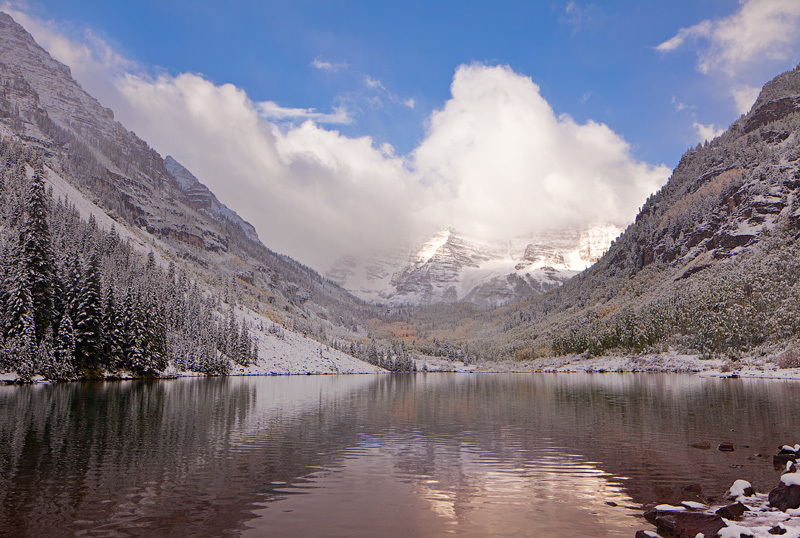 I later mentioned my time in Aspen to a photographer I ran into up in Wyoming, and he replied, “you mean the Moron Bells?” This was an inference that the hundreds of photographers who line up along the lakeside shoulder-to-shoulder every fall are moronic. I partly agree–with few exceptions it is moronic to join that crowd. The essence of landscape photography is to be artful–and art is synonymous with self-expression. One cannot express oneself in an individual way when one is lined up with hundreds of other photographers, all shooting the identical scene. It’s repetitive, and it gets boring. But, icons are icons for a reason, and I enjoy shooting the Bells. I just go out of my way to avoid the lakeside crowd, and forge my own way using any number of tricks I’ve learned over the last decade of my annual trips to Aspen. The shot above is an example. I never shoot from the near side of the lake, where the crowd forms. Sure, that has a ‘better’ view and enables one to shoot a ‘cleaner’ composition that abides by the ‘rules’ that get you more $ for your effort. But, I prefer a unique or more original view to a standard one that graces more postcards and calendars. So, for this shot that I took on the 24th, after the storm had completely cleared out, I used an approach that emphasized the contrast of the totally blue sky and fresh snow on the peaks. It’s a long exposure (10 seconds) and I left the dark areas intentionally dark to emphasize the contrast. I took the shot 45 minutes before sunrise, just as light was beginning to reveal the peaks. 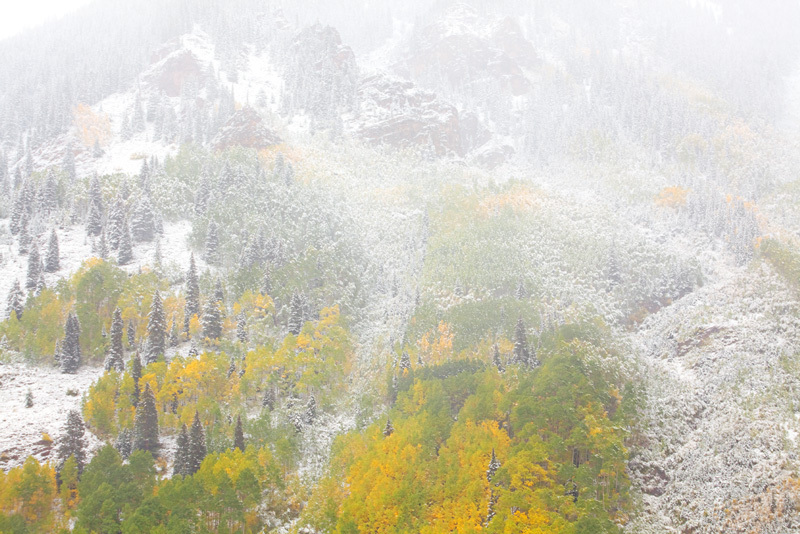 Now, lets go back to the day before, the first day of fall as an early snowstorm was winding down in the mountains. I had hoped the storm might clear for sunrise, but it strengthened a bit at the last minute, and slowed down, so it was still snowing when I got to the lake. There was a good 4-5 inches of wet snow at the lake; more than I expected. Even a bit of slush on the road. Since the storm wasn’t clearing around the peaks, I concentrated on the Foggy conditions and contrast of aspen and snow. The clouds were really swirling around Sievers Mountain, to the northeast of the lake, so I took some shots of the crazy fog climbing the rugged peak. 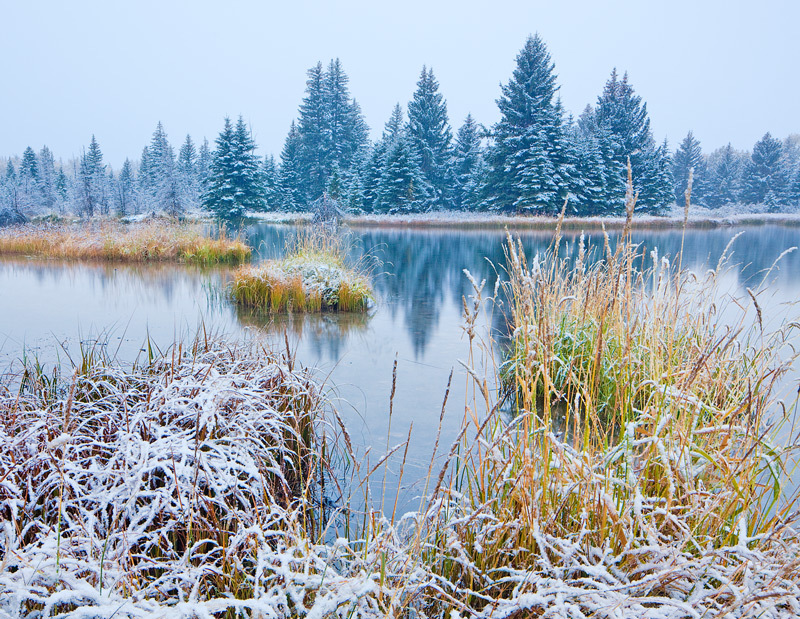 Sievers Mountain and fog during an early snowfall. Finally, the clouds cleared a bit and I got my first glimpse of the famous 14,000+ foot peaks. First day of Fall, 2013, Maroon Lake. Art and I decided to hang around and extra day in hopes of some fog forming around the lake the next morning. With clearing skies and lots of moisture on the ground, it was certainly a possibility. But the winds ended up being too strong, and no fog formed. I decided to avoid the even huger crowds at the near side of the lake, and explore some more original compositions. Maroon Lake at sunrise, late September. There was only one other photographer near me when I took that shot (200+ just up the lakeshore). 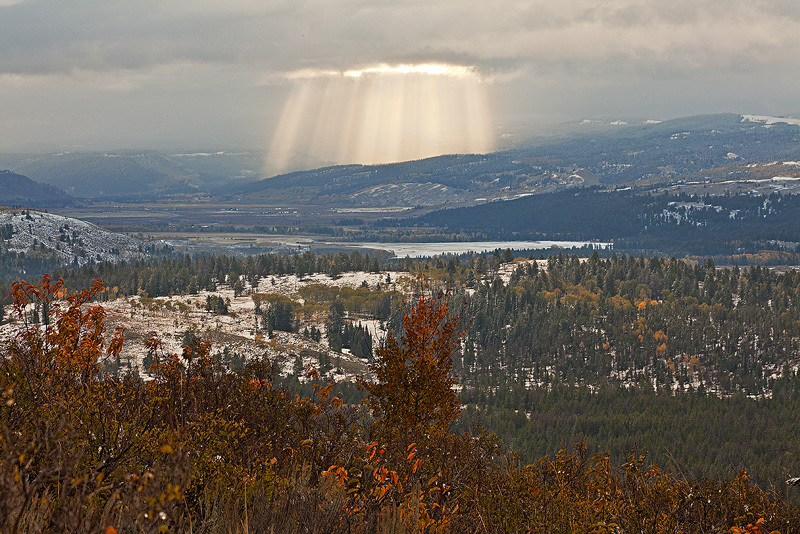 But I knew the best light was done at the lake, so I escaped the crowds completely and drove up the road. I found a nice wide open filed completely blanketed in frost. It was a beautiful field, So I grabbed my gear and hiked out to the middle to get some shots of the Bells in early morning light. 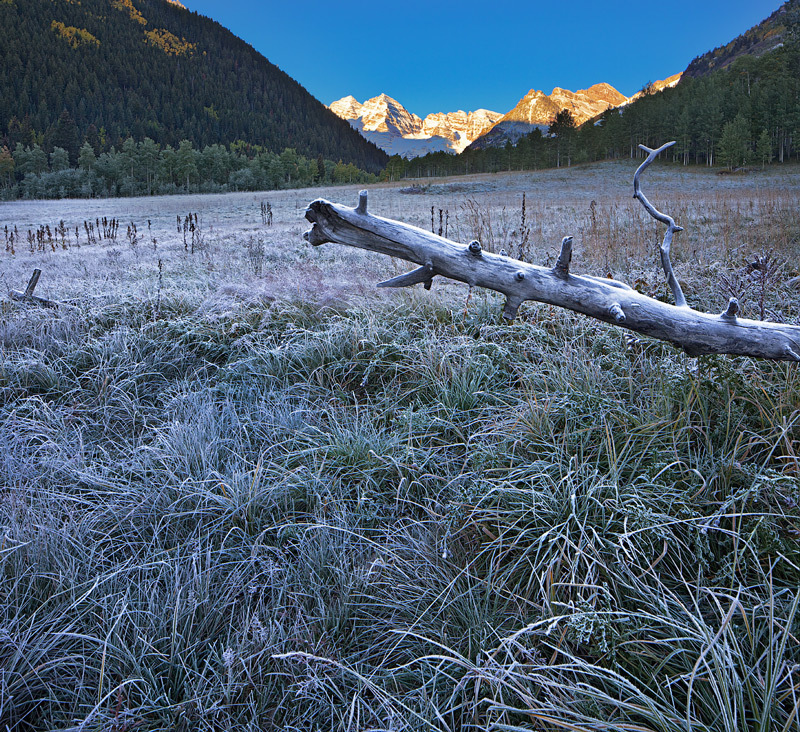 Maroon Creek area, on a frosty morning in late September. Not another photographer in sight. And I didn’t feel the least bit moronic. 🙂 Next up, in Part II: off to the Tetons and even more snow! !